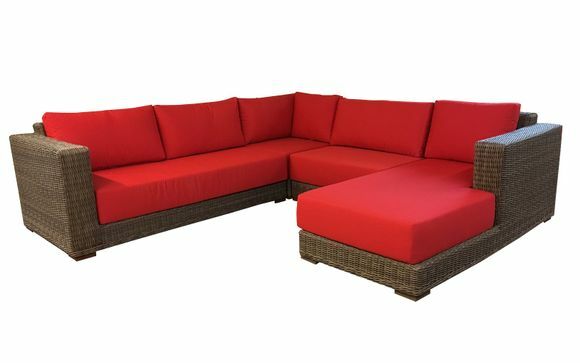 Sit back and relax in our super comfortable Santa Barbara outdoor wicker sectional with chaise. The sectional is made of synthetic wicker on an aluminum frame and features 9 inch thick cushions and is warrantied for 5 years. Roomy and made to accommodate up to 7 people the Santa Barbara sectional is finished in a warm honey wicker and is available in up to 25 Sunbrella fabrics. Ships in 2-3 days with the red Sunbrella fabric. PLEASE NOTE left side bottom cushions are made in 2 pieces.